20% OFF + Extra $15 Sephora Coupon - Verified 38 mins ago! 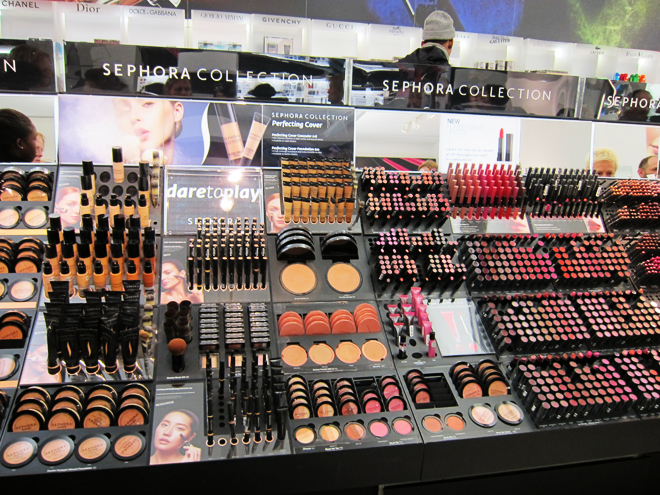 Sephora is a cosmetics and beauty brand owned by the holding company LVMH. It was founded in 1970 by Dominique Mandonnaud, and is headquartered in Paris, France, where it does close to $2 billion in revenue per year. Louis Vuitton and Moet Hennessy (LVMH) have owned the company since 1997. You can make savings on your online purchases by using our up to date list of Sephora coupons here at Coupofy. There are also Sephora in store coupons if you prefer to shop offline. Details: Get a Free 3-Pc Bite Beauty Gift Set with $35 for VIB Members only. Details: Get a Free Trial size Make Up for Ever, Step 1 Skin Equalizer Primer with $25 purchase. Valid for Beauty Insiders. Details: Choose a Free Becca Highlighter with $25 Order. Details: Get a Free Festive Sample bag of your choice on your orders of $45, for beauty Insiders. Shop the best deals on skincare, haircare, make-up, accessories and more, plus receive 3-day shipping for free when you spend $50 or more! Choose from fragrances, acne solutions, masks, and makeup. Valid sitewide. Up to 50% Off Big Beauty Sale! The business came to the United States in New York City in 1998, and now has its American headquarters in San Francisco, California. The company has its own private brand labels and stocks over 100 other brands alongside them. These products are sold in 1,700 stores in around 30 countries across the world, and online at Sephora.com. The e-commerce site was launched in 1997. In 2006 Sephora signed an agreement to open stores within existing JCPenny stores. In 2013 they launched celebrity collections with Mary-Kate and Ashley Olsen and Marc Jacobs. Brands include urban Decay, NARS, Make Up For Ever, Tatcha Aburatorigami, Too Faced Cosmetics, Sunday Riley Skincare, and many others. Bernard Arnault currently serves as Chariman and CEO of parent company LVMH, while Calvin McDonald has been President and CEO of Sephora since 2014. Sephora primarily sells cosmetics and beauty related products. For face and makeup you'll find tinted moisturizer, face primer, face powder, foundation sets, foundation, concealer, blush, contour, bronzer, luminizer, makeup remover, oil control and blotting paper, makeup sponges and applicators, face brushes and more. The Eye makeup category includes mascara, eyeliner, eyeshadow, eyeshadow palettes and eye sets, eyeshadow primer and base, under eye concealer, eyebrows, eyelash curlers, eyelash enhancers and primers, false eyelashes, eye makeup remover, and eye brushes. Under Lips you can buy lipstick, lip gloss, lip plumper, lip stain, lip liner, lip balm and treatments, and lip brushes. For their skin care line you'll find face wash and cleanser, exfoliators, toners, makeup remover, cleansing brushes and tools, moisturizer, night cream, BB cream and CC cream, tinted moisturizer, face oil, face mist, eye cream, decollette and neck cream, lip balm and treatments. Face serum and treatments, blemish and acne treatments, face masks, facial peels, eye treatments, sunscreen products, self tanning for face and body, cellulite and stretch marks products, hair removal, teeth whitening, mother and baby, supplements, oil control and blotting. For nails there is nail polish, nail kits, nail effects, nail base coats and top coats, nail treatment and remover, nail stickers and appliques, gel nails at home, manicure and pedicure tools. For hair, there are hairspray and styling, hair dryers, flat irons, curling irons, stylers, scalp and hair treatment, hair oil, hair thinning and hair loss, shampoo, dry shampoo, conditioners. Products to handle curls, frizz, shine, texture, volume. Hair color and root touch ups, hair brushes and combs, hair accessories, and shower filters. Tools and brushes has cleansing brushes, spa tools, hair removal tools, teeth whitening, hair dryers, flat irons, curling irons, stylers, hair brushes, combs, manicure and pedicure tools, tweezers and eyebrow tools, eyelash curlers, pencil sharpeners, mirrors, makeup brush sets, face brushes, eye brushes, lip brushes, makeup sponges and applicators and more. There is also a rnage of men's products, including colognes, deodorants, face wash, moisturizer and treatments, sunscreen, eye cream, grooming and shaving, aftershave, shampoo and conditioner, body products, cleansing brushes, spa tools, hair removal tools, makeup. Also fragrance and skincare value sets. You can also buy gift packages ranging from $10 and under to $100, which feature combinations of different products. Sephora coupons can be redeemed on products in all of these categories, allowing you to receive savings and other great offer. Sephora payment methods include most major credit cards, including Visa, MasterCard, American Express, Discover, and the JCPenney store card, as well as debit cards with the Visa logo. Sephora also has its own store card, online store credit system, and you can also redeem gift cards. If you are using a Sephora coupon code you can enter it in to the special promo box just prior to the payment step. 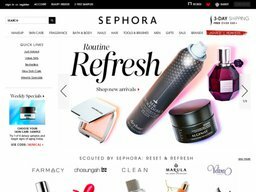 Sephora.com caters to both US, Canadian, and other international customers such as those in Germany, Japan, Netherlands, Norway, South Korea, and the United Kingdom. All pricing is displayed in dollars, but you can select you delivery country during the checkout process to calculate the appropriate shipping costs. In the US all orders over the value of $50 are shipped for free via standard 3 day delivery. Below this threshold you're charged $5.95. You can also pay $10.95 for 2 day shipping, or $16.95 for 1 day shipping. International orders have various different options. Sephora's return policies are listed on their website under Customer Service. In order to get a full refund you must return your items within 60 days of the purchase date. After this you will only be offered an exchange or store credit up to a 90 day limit. All orders are shipped with a returns form and prepaid shipping label. Shipping costs can only be reimbursed if you received the order in a defective or damaged condition. @winterluungs Oh no! We recommend contacting the store you visited at your earliest convenience so they can help. @bfkoontz Hi there! We're happy to take a look further. Please send us a DM with your order numbers when you have a moment. Thanks!